Breaking a screen, microphone, charging port or just about anything else on your Samsung device shouldn't require you to also break the bank for the repair or a new device. iRepair Kansas City saves you time and money by fixing your Samsung Galaxy device without the hassle of shipping the phone to a repair depot where you could lose all of your personal information on the damaged phone. Without prior knowledge, repairing a Samsung Galaxy screen can be a daunting task, which is why it is in your best interest to use a qualified technician, such as those from iRepair Kansas City. Samsung devices require a steady hand, a working knowledge of their devices and special tools to prevent any sort of internal damage while repairing. 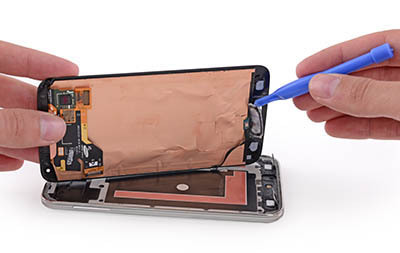 We repair Samsung screens, microphones, buttons, phones not charging, not turning on and water damage - depending on the severity of the water damage - and know the intricacies of these devices. Although Samsung makes it easy to replace batteries, they do not make it simple to replace screens. We have extensive knowledge in Samsung devices and keep most parts in stock so you can get your phone back to 100% in a few hours, instead of a few days to weeks. Contact us today at 816-888-9433 or fill out the form to get started!